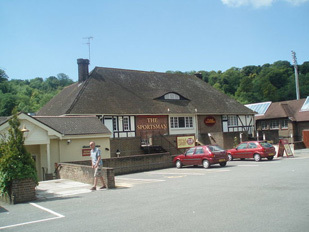 Nestled in between Withdean Stadium and gym is the Sportsman pub. I think the last time I visited was about 10 years ago when it had the soft play area in the corner and I don’t know why I didn’t remember it! But a lot has changed since then and its had a well needed facelift, soft play eradicated and more tables are in its place. Through the main entrance the pub is split into over 21′s on the right and family pub on the left, which I’m happy with, as not everyone thinks your kids are cute and so might actually want a peaceful lunch! We went at lunchtime on a Saturday which was a good time to go as not too busy. Plenty of parking outside. Inside It had a nice relaxed atmosphere unlike another local pub which can be very noisy and bustly. We sat with our table overlooking the stadium and watched the football players practising. I would imagine the place would be heaving when they have a football match on. One of my biggest bug bears is being given a high chair that has seen the remains of the last 5 childrens dinners caked all around it and you have to spend ages scrubbing it off before its remotely hygienic, but thankfully this one was very clean!! Big brownie points there!! Value for money – this place was tops! They do a normal menu but I think the best option is the carvery. I’m vegetarian so I do hesitate when it comes to carveries, mostly the logistics. If I order my meat substitute ( in this case it was a red pepper and bean Kiev). When do I go up? Will I be hanging around like a lemon? Do I get my veg first? What’s vegetarian and what’s not? Our waitress came over with a ticket for the meat and vegetarian carvery which you take when you go up and collect and she told me when my veggie dish was ready/on the pass, which I did appreciate as then I knew when to go up and help myself to the veg. Gravies are all veggie and labelled. I forgot to ask about the stuffing. My carnivore bf was happy with the meat distribution ( some places can be really tight with their meat!) The Yorkshire puds need work but now I’m being picky! The Toilets/ facilities and the Baby changing is on ground floor in the disabled toilets, so no need to lug heavy buggies up unnecessary stairs. I think a good waitress makes or breaks it for me. ‘Overly attentive’ makes me a bit paranoid, ‘no-where-to-be-seen’ makes me frustrated, ‘falsely nice’ makes me cynical! But our waitress was lovely, just the right amount of everything. Overall food amazing value and tasted good, staff were pleasant, nice atmos, tables, high chairs and carvery area nice and clean, definitely going back again and taking more people with me! If you would like The Daily Toddler to review your family friendly pub/eatery please feel free to email me.